Cornelius Cyril “Bud” Krupp, 92, of Tiffin, passed away on Tuesday, January 15, 2019. He was born on November 12, 1926, in Tiffin, to Cornelius J. and Agnes M. (Weithman) Krupp. On October 23, 1948, he married Pauline A. Burkart, and they were married 64 years, until her death in 2012. Survivors include three sons, Mark (Terie) Krupp of Tiffin, Retired Colonel Christopher (Lisa) Krupp of Augusta, GA and Peter (Dianna) Krupp of Tiffin; two daughters, Kathleen (Daniel) Leahy of Richmond, VA and Ann (Peter) Delehanty-Koenig of Cincinnati; nine grandchildren, Amy (Stephen) Leahy Shutts, Craig (Lisa) Leahy, Reini (Michael) Chipman, Zachary (Neetu) Krupp, Christiane Krupp, Katherine Krupp, Paige (Adam) Mitchell, Morgan Krupp and Jack Delehanty; six great-grandchildren, Connor, Colleen and Cooper Shutts, Colin and Mary-Cameron Leahy and Nash Thomas Chipman; brothers, Ronald Krupp and David Krupp; and sisters, Mary Nucifera, Lina Weimerskirch and June Swope. He was also preceded in death by his parents; brother, Thomas Krupp; and sisters, Elizabeth Decker and Dorothy Link. Bud was a loving and devoted husband, father, grandfather and great-grandfather. 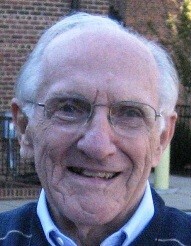 He was a 1946 graduate of Calvert High School, a parishioner of St. Joseph Catholic Church, Tiffin and longtime member of St. Joseph’s men’s choir. A Certified Dental Technician and owner of Tiffin Dental Laboratory, Bud served the area dental community for over 70 years. He was loved and respected by all who knew him and will be remembered for his generosity, work ethic, creativity and sense of humor. His Funeral Mass will be at 11:00 A.M. on Friday, February 1, 2019 at St. Joseph Catholic Church with Rev. Joseph Szybka officiating. Burial will be at a later date in St. Joseph Catholic Cemetery. Friends may visit and share stories with the family from 9:30 A.M. until the time of the funeral on Friday, February 1, 2019 at the Church. Memorial contributions may be made to St. Joseph Catholic Church or to St. Francis Home.